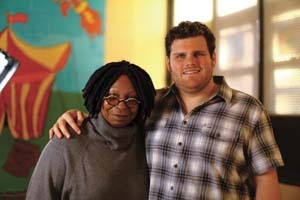 Max Fisher with Whoopi Goldberg in New York City after he interviewed her for his documentary “I’ll Not Go Quietly.” // Photograph Courtesy of Fishsoup Films. Max Fisher admits he’s got big shoes to fill. 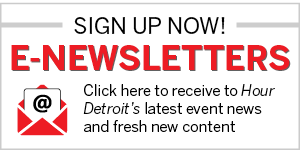 His grandfather, after whom he’s named, was a businessman and philanthropist whose contributions include Detroit’s Max M. Fisher Music Center. In addition, his mother, Mary Fisher, is a prominent HIV/AIDS activist, a cause she adopted after contracting the disease from her second husband — Max’s father. She learned of it only after their divorce in 1990 (Max tested negative). Fisher used her family’s platform of prominence to speak out for the compassionate treatment of people with the virus, delivering speeches at the 1992 and 1996 Republican conventions. She’s tackled the misconception that HIV/AIDS affects only people who are promiscuous, gay, or use IV drugs. Now, the younger Max has taken up the cause, producing an HIV/AIDS documentary named for his mother’s second book, I’ll Not Go Quietly. After completing film school at Full Sail University in Orlando, Fla., and working under Michael Moore on Capitalism: A Love Story, the 24-year-old recently established his own production company in Traverse City, where he paused to chat. I had this need to figure out how to make movies. I watched movies constantly. So I went to film school and have been making movies since 2009. But the reason I got into this documentary film is because it’s my passion. What we’re looking at is the next generation of HIV/AIDS activists — my generation. I don’t want my generation to drop the ball. We’ve stopped production for the summer so I can concentrate on building characters and building story, so I can find those next-generation activists. We’ve already talked to the people that have been doing it forever, like my mother. We’ve talked to Regan Hofmann, editor of POZ magazine [an HIV/AIDS publication]. We’ve talked to these big names, but we need to find that smaller story to bring it back home. This stigma is still just as bad as when the disease first came out. There are parts of America where people can’t tell their family that they’re HIV-positive because they’ll get kicked out. Or they can’t say it because they fear that their church will not accept them. Has society become complacent about the issue? Being complacent isn’t the right term. HIV/AIDS is not a designer disease. We need to solve all of our humanitarian ills, like homophobia and racism, before we can solve this disease. She hasn’t stopped once from fighting the fight. She’s still as active. She’s the Energizer Bunny — she just keeps going and going and going. Do you recall how your mother told you she had the disease? I don’t remember the first time she told me about it. It was just something that we lived with. It was something that we all knew she had, but it was more like: “Mommy’s not feeling well.” As a kid, that’s all you should know. As a 3-, 4, or 5-year-old, nothing else should matter. I’ll Not Go Quietly is scheduled for a Spring 2013 release. Information: fishsoupfilms.com.